Hope everyone had a wonderful Thanksgiving and Eid! Here’s my latest essay from the Wall Street Journal. A naturalization test at an immigration office in Boston was the last hurdle standing between me and U.S. citizenship. But for me this journey had actually begun years before, on a rickety vessel you may have heard of—The Mayflower. Except in my adaptation, that leaky ship sailed down the Red Sea to the New World of Jeddah, Saudi Arabia, where I proudly played the role of a pilgrim in a kindergarten play at the American school. Decked out in a gray frock and a hat fashioned from black construction paper, I prepared to welcome a band of friendly Native Americans to the very first Thanksgiving. In my five-year-old mind, it seemed perfectly logical that a scrawny Indian girl with brown skin and a Canadian passport should be charged with inviting those other Indians (feather, not dot—although I’m Muslim so we don’t have either) to celebrate the founding spirit of America. In a desert nation, no less, thousands of miles from Plymouth Colony. Easy question, no easy answer. We’re called TCKs—”third-culture kids”—studying at international schools in faraway lands, and wind up cultivating a hybrid culture that’s neither apple pie nor masala chai. I was born in Toronto but moved to Saudi Arabia when I was a baby, so my ties to my birth country were tenuous. Summers were spent carting boxes of Oreos and Capri Sun to Hyderabad; winters involved snowball fights with cousins in Michigan. For International Day, I’d don an elaborate Indian ensemble and march with the Canadian contingent of the parade, but thanks to the school curriculum and our frequent trips to the States, my insides bled red, white, and blue. From my Saudi classroom I could rattle off every U.S. state capital, but damned if I knew where Ottawa was. Intending to head to the U.S. instead of Toronto when our Middle Eastern sojourn was over, my parents filed for green cards—which, incidentally, were pink—and we eventually wound up moving to Massachusetts when I was in high school. Even though I’d never actually lived on this side of the pond before, it felt just right. I may have traveled to 25 countries and lived in four, but in my vision of the land of opportunity, the streets were paved with Golden Arches. Suddenly there I was, a stone’s throw from Plymouth Rock. But despite this long-awaited homecoming, we never got around to wrapping up the requisite paperwork and actually becoming citizens. So I went on to college, a Canadian girl who’d never really lived north of the border, a pseudo-American who somehow got her Valley Girl accent in Saudi Arabia, by way of India. With a composite like that, I never really knew where to slot myself, so I elected to have fun with it. Americans really get riled up by their neighbors in the 51st state, I learned quickly. I kept a mammoth Canadian flag in my dorm room, just to annoy people, and I discovered that “Oh, I can’t, I’m Canadian,” is the ultimate get-out-of-jury-duty-free card. Fittingly enough, Thanksgiving became my favorite holiday, thanks mostly to the tandoori-style turkey dished up by my aunt at the annual Khan feast. For years, I lived like a citizen without actually being one. I reaped all the benefits at home, then easily slipped into the role of friendly Canadian tourist abroad. Then 9/11 happened. Whispers began swirling of Muslims being deported for no good reason, and suddenly that became the motivation we needed. After all, God forbid the Department of Homeland Security ship us back to Canada. A whole country north of Buffalo? Shudder. And that’s how, in the spring of 2002, I found myself at the nondescript immigration office in Boston, ready to rouse my own American dream from hibernation. Like any other kid raised in the American school system, I’d spent years dedicatedly forgetting everything I’d ever been taught about government. Who knew there were 435 voting members of Congress? But I did now, thanks to my last-minute cramming efforts that morning, and I sat down confidently in front of the officer, prepared to wow him with my civic knowledge, good moral character, and patent lack of communism. “What do you do, Sarah?” asked the man standing between me and my new passport, continuing his effort at amiable banter. “I’m a junior at Boston College,” I replied. Considering he spends his days interacting with people of varying levels of literacy, my soon-to-be interrogator seemed excited to discover that I was an English major. He wasted no time engaging me in an animated discussion about the literary merits of Chaucer. Let’s do this, I thought. Just wait till I dazzle you with my newfound knowledge of the electoral college! I am happy today? This, after I’d just spent the last 15 minutes dissecting The Canterbury Tales? Annoyed by the request, I still wrote the words in my finest handwriting, hoping not to let down the entire English department of Boston College. Then my literary friend probed me on my knowledge of the stars and the stripes, and rewarded me for remembering that the Constitution was written in 1787. I was informed that I’d passed with flying colors, fingerprinted for posterity, and sent on my merry way. A few months later my parents, proud citizens themselves, joined me in Boston’s historic Faneuil Hall for my oath. I’d donned yet another gray outfit for the occasion—slacks and a blazer this time, and no construction-paper hat—and was ready to be sworn in to my not-so-new life. I took my seat amid the kaleidoscope of eager faces, each concealing its own story of what it meant to be there. For some, this day symbolized the culmination of struggle, success, and a dream; for me, it was just the inevitable conclusion of a lifelong voyage. When the judge finally led us in the Pledge of Allegiance, a thunderous chorus resonated throughout the room, reciting the words in unison—except for the judge himself, that is. In an ironic twist, he stumbled over the lines, then turned cherry red as he was corrected by a symphony of accents. And then it was all over. I left the courthouse clutching my naturalization certificate, my own little piece of the (apple) pie. Thanksgiving in my family is a true coming together of Indians and Americans—but one far different from what the Pilgrims may have envisioned. I wear shalwar khameez and head over to my aunt’s house, the center of operations for the Khan family affair, where we rip into an eclectic spread: halal turkey with desi-style masala; good old-fashioned mashed potatoes, stuffing, corn, and pumpkin pie; lasagna and macaroni for the vegetarians—all preceded by, of course, samosas and pakoras. The guys take over the big screen in the family room to watch football while Bollywood reigns supreme in the den in the form of Indian karaoke. And like millions of others across the country, we all slip blissfully into the food coma—until it’s time to hit the Black Friday sales at 3 a.m. It doesn’t get more all-American than that. 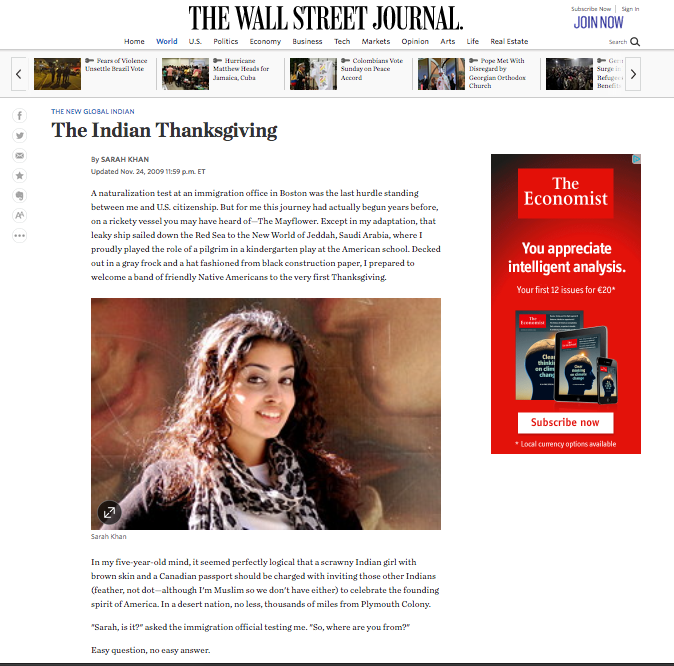 New Global Indian scouted around for favorite Indian Thanksgiving recipes. Here’s a sampling, thanks to writers Sarah Khan, Meera Nair and Anupy Singla. Take out the turkey in a large plate/tray, carve it nicely, (sprinkle fresh coriander leaves & thin sliced almonds if desired) and enjoy a delicious meal along with other prepared items. Bring a pot of water to a roiling boil and add 1 tablespoon lemon juice. Drop the beans into the water and boil for 4-5 minutes. The beans should be a bright green. Remove the beans with a slotted spoon and plunge them into the iced water. Drain and set aside. Heat oil in a skillet or frying pan. Working quickly, add the urad dal. When the dal begins to turn pale brown, add the mustard seeds and dry red chilli. When the mustard seeds pop and the chilli darkens put in the onion slices and saute until golden brown. Stir in the coconut and toast till pale brown in color. Add ghee and salt. Take the pan off the fire and mix in the beans and salt and toss gently. Once the heat of summer settles over most of North India, fresh corn starts to pop up in piles along busy streets. The street vendors squat alongside their respective bounty and a pile of hot coals between two bricks. Visiting India as a child, I loved watching as they took my cob, quickly pulled back the green and began roasting it on the orange, fiery coals. Slowly, as they fanned the fire the once bright yellow kernels would pop and turn blackish brown. The smell was irresistible, and taste even more so after they took a halved lemon, dipped it in pre-mixed spices and rubbed the corn down. Desperate for a similar experience in America, I began roasting corn on my stovetop. I’ve almost succeeded in recreating the experience. The result is worth the clean up. My girls eat their spicy corn on the cobs as after-school snacks. For the last few years I’ve served this Indian favorite in a bowl, modifying it into a perfect Thanksgiving side dish. I came to this site by searching Yahoo. I must say that this looks tempting. Thank you for taking your time posting this! By a very strange circuitous route, I found you. And now you have a new fan. I love your writing. I’ll keep reading.